If you like the mineral-rich taste of chard or spinach, then you’ll love the flavor of lambsquarters. This leafy green is actually classified as a “weed,” but it is such a wonderful ingredient to add to your everyday recipes that some farms plant it intentionally. Much like other hearty greens, the entire plant can be eaten, leaf to stem. To prepare, simply steam or saute until tender. 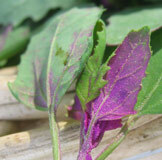 Young lambsquarters can be eaten raw in salads. Lambsquarters need very little seasoning to taste delicious, and they contain a long list of essential vitamins too.